Leonard Bernstein (1918-1990) aus "West Side Story"
The telling of different stories lies at the heart. Eleven “musical stories” written by a number of artists that belong to completely different musical traditions were chosen. Besides the mere telling of different stories, the recordings attempt to the well-known stories in a different way. All time favourites of the classical repertoire appear under a new light when interpreted by a saxophone quartet. 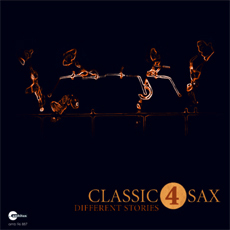 To go even one step further into the interpretation of the title, this CD also tells the “different stories” of the quartet Classic4Sax and its members. Four different saxophonists, with their distinct musical biographies, with their “different stories”, have come together to form one homogenous quartet.